The spotlight effect is a cognitive bias that causes people to think that they are being observed and noticed by others more than they actually are. People experience this bias because they naturally see everything from their own point of view first, so they struggle to imagine how they look through other people’s perspective. In the following article, you will learn more about the spotlight effect, see examples of various scenarios where you might experience it, and understand the psychology behind it. Then, you will learn how to reduce its influence, so you can become less self-conscious and more confident. 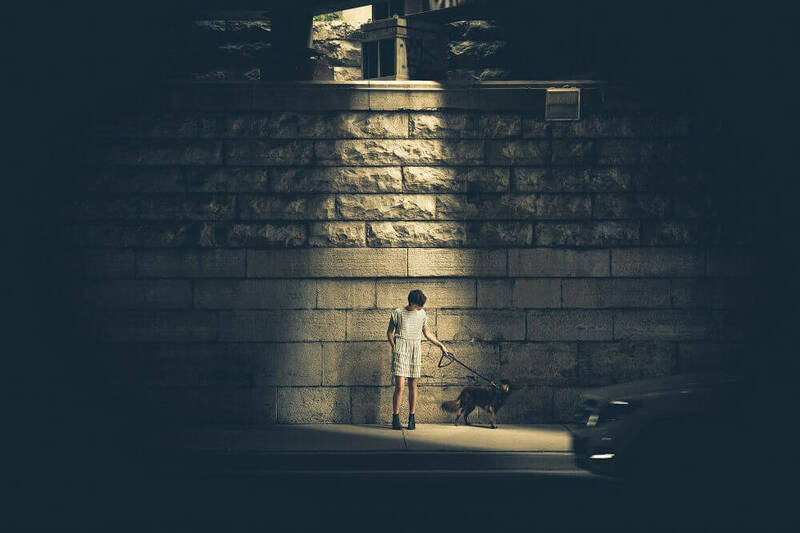 The spotlight effect is a cognitive bias that causes us to overestimate the degree to which we are observed and noticed by other people, as well as the degree to which others care about the things that they notice about us. This means that the spotlight effect causes us to assume that other people are more likely to notice and care about our appearance and actions than they actually are. One study which exemplifies the spotlight effect examined students, and found that they tend to overestimate how noticeable variations in their appearance and physical attractiveness are to their classmates. Essentially, as the researchers put it: “the blemishes and cowlicks that are so noticeable and vexatious to oneself are often lost on all but the most attentive observers”. The spotlight effect is something that we all experience frequently in our everyday life. Essentially, whenever we think about what other people think about us, we tend to overestimate how likely they are to notice things that we do, as well as how likely they are to care about those things. When people wear clothing that they think is embarrassing, they tend to overestimate how noticeable their clothing is to others. Similarly, when people wear clothes that are counterfeits of expensive brands, they tend to overestimate the degree to which other people are likely to notice or care that they are doing so. When people participate in group discussions, they tend to overestimate how memorable their negative contributions are to other members of the group. When people participate in a sport or play a video game, they overestimate the likelihood that their teammates will notice mistakes that they make. We experience the spotlight effect because when we think about how other people see us, we suffer from an egocentric bias, which is the tendency to anchor other people’s viewpoint to our own. Essentially, since we are so used to seeing things from our own perspective, we struggle to accurately judge what other people’s perspective is like. The anchoring-and-adjustment mechanism which stands at the base of the spotlight effect also leads to a similar cognitive bias called the illusion of transparency, which causes us to overestimate how well other people can discern our emotional state. In both cases, we tend to be quite focused on our own actions and thoughts. Though we realize that other people are generally less attentive to our actions than we are, and don’t have a direct access to our thoughts and emotions, we struggle to fully take this into account. Accordingly, we end up believing that other people’s perspective is more like our own than it actually is. When this happens, we end up experiencing the spotlight effect with regards to our external appearance and actions, and the illusion of transparency with regards to our internal thoughts and emotions. Overall, we experience egocentric biases such as the spotlight effect and the illusion of transparency due to our failure to account for the fact that other people’s perspective is different than our own. Specifically, in the case of the spotlight effect, since we are so focused on our own appearance and actions, it’s difficult for us to remember that other people are not as focused on what we look like or on what we do, since they are already preoccupied with their own lives for the most part. As we saw so far, the spotlight effect causes you to overestimate how likely other people are to notice negative things about you. The problem with this form of thinking is that it increases your anxiety, and can prevent you from taking actions that are in your best interest, simply because you’re unnecessarily worried about what other people might think. While it’s difficult to avoid this form of biased thinking entirely, being aware of it can certainly help reduce the negative impact that it has on you. Essentially, if you did something that you regret, or if there is something that you feel self-conscious about, try to assess the situation in a realistic way, and think about how likely other people are to notice it. When in doubt, assume that you are likely overestimating how much people care about this, and try to relax. Remember that, even if someone does notice whatever you are worried about, they probably won’t care about it nearly as much as you think, and they probably won’t remember it in the long-run. While being aware of the spotlight effect can likely help you reduce its influence, you can benefit from also using self-distancing techniques, which can help you reduce the egocentric bias that promotes the spotlight effect in the first, and thus allow you to see things in a clearer, less biased manner. Specifically, using these techniques entails trying to create psychological self-distance when considering how other people view you. This means that when thinking about how other people see you, you should try to look at yourself from a perspective that is different from your own. You can do this by using any perspective that is not the first-person perspective, meaning that you can either try to look at yourself directly from someone else’s perspective, or you can try to see yourself from a general, external perspective. The more you commit to trying to see things from a different perspective, the more clearly you will be able to think about yourself, so try to truly visualize yourself while being in someone else’s shoes. In addition, another thing that you can do in order to promote psychological self-distance is ask yourself whether you would notice whatever you are worried about if someone else did it. For example, if you’re worried that people will notice an embarrassing shirt that you’re wearing, ask yourself whether you can remember what other people that you met were wearing, and how much you cared about what they wore. This is something that some people will still tend to overestimate, but which can help you put things in perspective in some cases. Sometimes, getting external feedback can help you overcome the egocentric bias that causes the spotlight effect, by helping you to put things in perspective. Specifically, if you are worried about other people noticing something about you, you can ask someone that you trust for feedback on how noticeable it is. This can help you identify cases where you are overestimating how much attention other people are paying to you, and can help you see just how much you tend to overestimate this. As we saw so far, the spotlight effect means that people tend to overestimate how likely other people are to notice things that they do. While we focused primarily on our tendency to overestimate the likelihood of people noticing negative things, in reality this bias to both the negative as well as to the positive things that we do. For example, we saw earlier that we usually overestimate the likelihood that other people will notice it if we wear an embarrassing T-shirt. However, research shows that we also overestimate how likely other people are to notice it if we wear a T-shirt that we think is flattering. Similarly, we tend to overestimate the likelihood of people noticing the smart things that we say during a discussion, just as we are likely to overestimate the likelihood of them noticing the dumb things that we say. We also tend to overestimate the likelihood of people noticing positive moves that we make in sports or when playing video games, just as we tend to overestimate the probability of people noticing our mistakes. Overall, what this means is that when it’s appropriate to do so, you need to make sure that people are aware of the positive things that you do. In cases where it’s not appropriate to highlight your accomplishments, make sure to at least be aware that people aren’t as likely to notice them as you might assume, so that you can take this into account in your behavior. While the spotlight effect causes us to overestimate the likelihood that other people will notice various things about us, that doesn’t mean that we are wrong every time we think someone will notice something about us. This is true both for the negative things that we do, as well as for the positive ones. Overall, your goal should be to reduce your inherent bias when it comes to estimating this likelihood, so that you can think in a clearer, more rational way. For most people, learning to mitigate the spotlight effect means learning to not worry so much about the small things that you do, which can help you become less self-conscious, less anxious, and more confident. The spotlight effect is a cognitive bias that causes people to assume that they are being observed and noticed by others more than they actually are. We experience the spotlight effect because we are so used to seeing things from our own perspective that we tend to anchor other people’s viewpoint to our own. The spotlight effect causes us to overestimate the likelihood that people will notice negative things about us, whether it’s an embarrassing shirt we wore, something stupid we said during a discussion, or a mistake we made while playing a game. This is problematic, since it can cause us to feel unnecessarily self-conscious and anxious, and because it may prevent us from taking action that can benefit us. Being aware of the spotlight effect can help you reduce its impact, and you can further reduce it by using self-distancing techniques, which involve trying to view yourself from an external perspective. The spotlight effect also means that we tend to overestimate the likelihood that people will notice positive things about us. It’s important to be aware of this, so that you can take credit for your accomplishments when necessary, and improve your understanding of how people perceive you.